For once, a fantasy can become a reality! You have a unique opportunity to "break the earthly bonds of gravity," and if you've been dreaming about flying--try this! The adventure begins when we meet our guests shortly after sunrise when the mountain air is still calm and stable, the perfect conditions for ballooning! Ballooning is a "hands-on" participation sport, and we will enlist your energy in the set-up and inflation of the balloon which will hold up to six passengers and the pilot. You'll want to have your camera ready to capture the excitement as our beautiful giant (120 feet tall, holding 240,000 cubic feet of hot air) rises for its journey. You'll then climb aboard our basket for the flight of a lifetime enjoying the enchanting sights and tranquility that can only be experienced from a hot air balloon. Imagine a magic carpet ride! 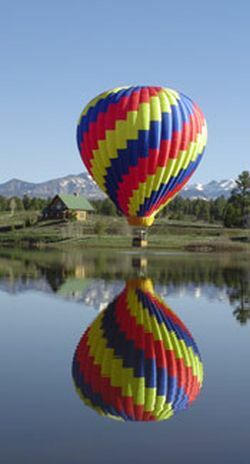 We may fly inches over the area lakes for a breathtaking "splash-n-dash," a little higher for some souvenir pine cones from the tops of trees or up to 3,000 feet for a 200 mile panoramic view of 4 states. Throughout the flight, there is no sense of height or motion, only a dreamlike floating sensation. Because a balloon moves at windspeed, you could hold a candle and the flame would not flicker! We offer half hour and one hour flights year-round, but please allow 3 to 3-1/2 hours for the complete excursion. Advance reservations are required. Special arrangements for birthdays, weddings, anniversaries or other occasions may be made in advance.